There are several open debates on the use of 3D architectural renderings projects. We can find arguments for or, on the contrary, some critics to suggest that the renders are a fanciful idea and, once the project is executed, it doesn’t correspond to those 3D computer graphics images (3D CGI). One thing both supporters and detractors agree, the 3D architectural renderings is the best promotional tool for selling a project. Provides a clearer view of the project by making it more understandable to those outside the architectural world. 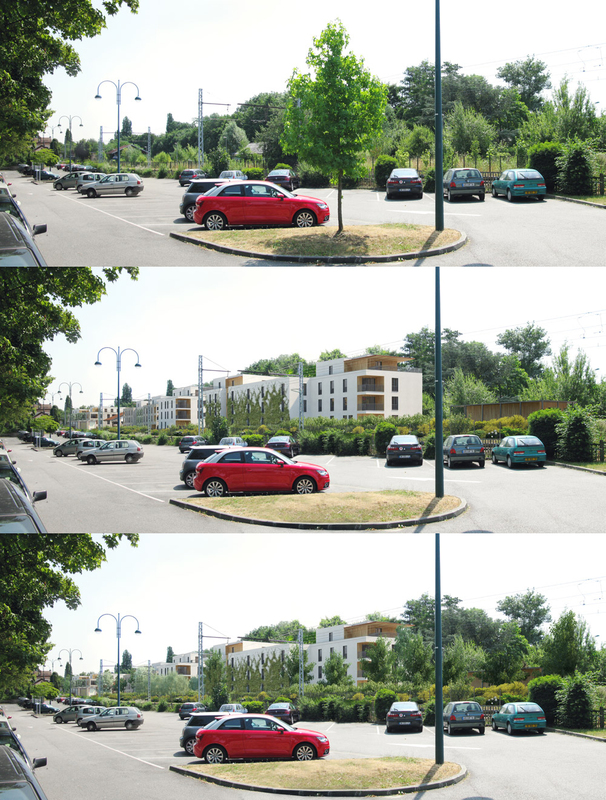 In this last work the architect Dominique Hertenberger needed a 3D Photomontages series that reproduced the integration of his new housing project in the current surrounds. 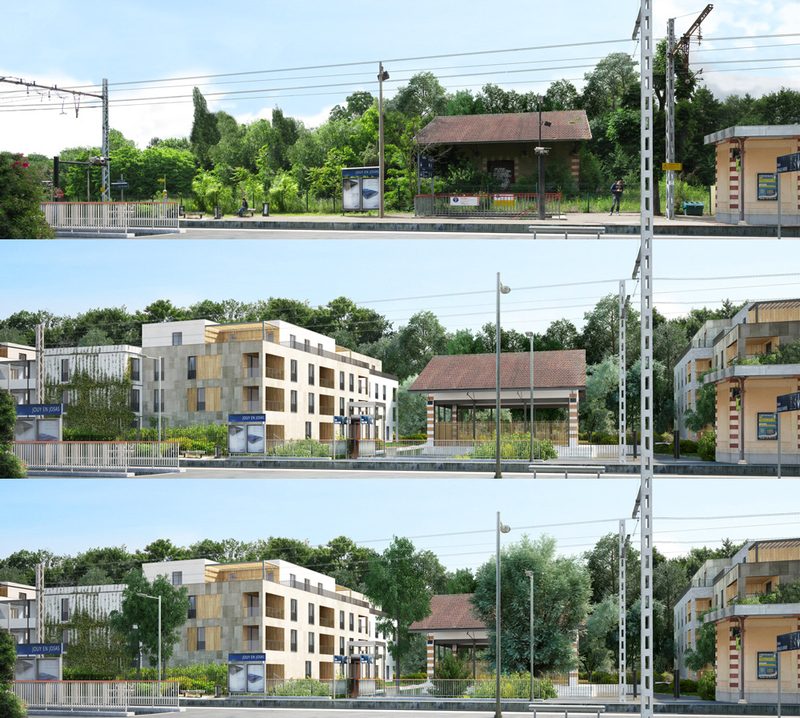 The images serve for the public display of the project at the City Hall of the town, in order to let the neighbors to know the architectural proposal and express their opinion on. From some shoots taken in situ we should blend the new buildings into its surroundings. This way, the before and the after could be easily distinguished. There are four apartment buildings located in Jouy-en-Josas, near Paris, France. A plot clearly delimited by the Biève river and the railroad tracks, with the presence of abundant and dense vegetation. A project carried out by the team of landscapers who indicated the types of plants, shrubs and trees that would be placed in. Another key point of the project are the exterior spaces, paths that flowed into small squares with benches that become the perfect meeting point for the neighbors. The difficulty of the 3D architectural renderings lay in the vegetation. The building should be totally blended into the existing surroundings. 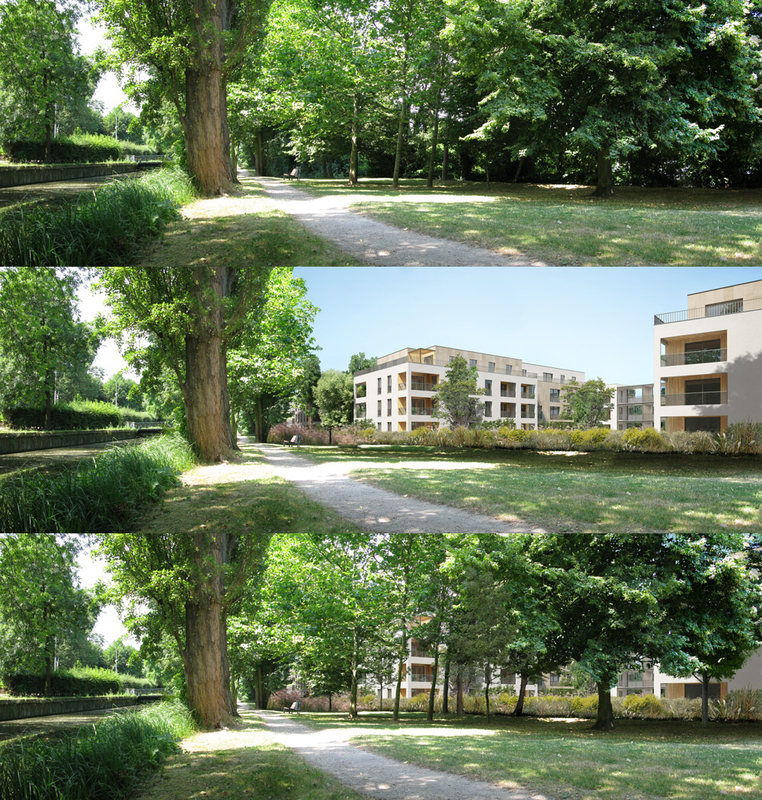 Three images were delivered for each requested render, the final image with the buildings and its surroundings, an intermediate step reducing the opacity of the vegetation, showing this way the buildings and the last one was the actual state of the surroundings, which was obtained by photo merge and photo retouching techniques. This article is published after the public exhibition which was a success for the architect’s firm. Therefore we can only give them our most sincere congratulations.